Leave it to the only online casino and poker room operated by a global financial services group to offer true multi-currency capability. 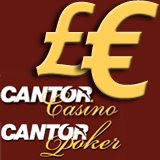 Cantor Gaming, which operates CantorCasino.com, CantorPoker.com and CantorFinancialOdds.com, has just updated CantorCasino.com to not only enable players to deposit and withdraw in their choice of Pounds or Euros, but now their player accounts will be kept in those currencies when they play, not just at the cashier. No more currency conversion at withdrawal time – players’ accounts will display balances and transactions in their chosen currency whenever they log in, wherever they are in the casino. Further, all bets at any game will be in the native currency of the player’s account. So a Euro account holder will bet in Euros and not in “casino chips” or some other currency. Cantor affiliates welcome the improved currency integration since online gambling is growing across Europe and many online casino affiliates have focused on serving European markets where the Euro is the local currency. Many online casinos court European players by seeming to conduct business in Euros when, in fact, during game play account balances and wagers are actually displayed in Pounds or US Dollars. Typically, the only time Euros are an option is at withdrawal. All account balances and wagers can be given in Euros while playing any of the traditional casino games at CantorCasino.com or any of Cantor’s unique advanced games like Statjack, the new card counting Blackjack game, XtraOdds(tm) Baccarat and Bonus Roulette. Players that like to wager on the markets at CantorFinancialOdds.com also have the choice of Pounds or Euros when they place their bets. Cantor Gaming sites accept deposits by Visa, Mastercard, Neteller and Moneybookers. Players can withdraw their winnings hassle-free next business day and via Neteller, Moneybookers, cheque or bank transfer.